It's really not my style to poke fun at anyone but myself on my blog, but in the case of a certain politician's wife, I really and truly cannot help myself. 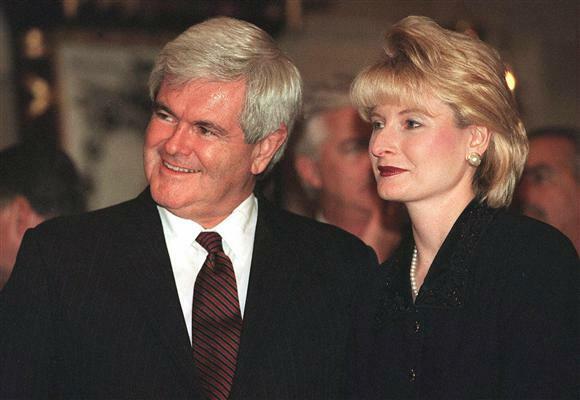 I've been finding myself a little fascinated by Callista Gingrich, wife of Newt Gingrich, lately. At first it was because of her hair. I can't get over her hair. Does it ever move? How does she get that perfect wave on the side? How does it stay in place? 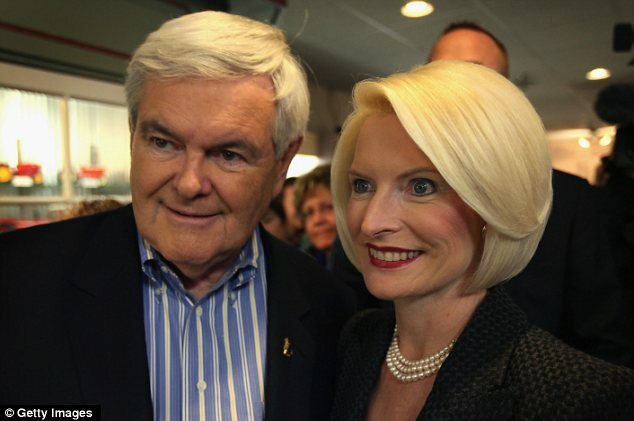 Why does she dye it so unnaturally blond? In short, what's up with her hair?! I couldn't decide if I liked it or hated it and finally went with the latter. It's just too fake-looking. (I think it's still overall probably better than my hair though...boo.) Then I realized that that's not all that's fake-looking. 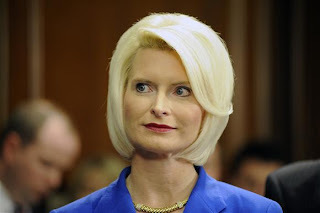 When I was searching on Google for pictures of Callista's hair, I noticed that she looks quite a bit different now than from how she used to look. This was them back in the 90s. She looks like Martha Stewart! Doesn't her face look different now? I know it's a decade later, but my investigative instincts (and the eyes on my face) tell me that there is something else going on here. 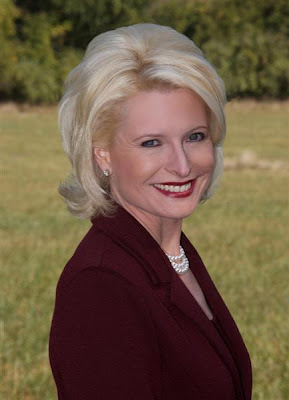 You hear about Botox and plastic surgery and all these anti-aging procedures and things, and I feel like I'm seeing that whenever I see her. 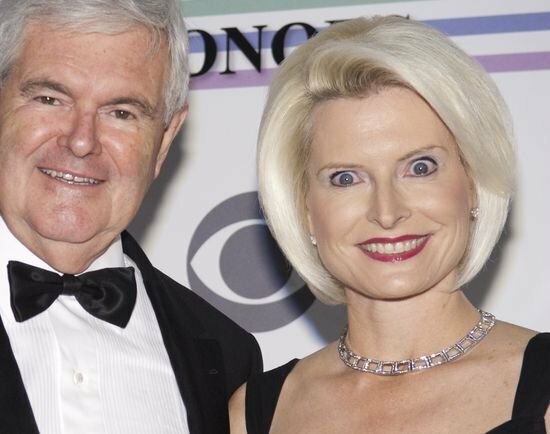 The following picture SERIOUSLY startled me when I saw it. I had to minimize it on my screen because it was giving me scary visions of her coming after me with a big shiny knife with this expression on her face. What the heck?! Too much Botox, or too much of an eye lift, or...something. This woman, on the other hand, does not scare me at all, and this is what I mean by being true to yourself and your natural beauty. Ann Romney's hair color is much more natural looking (even if she does get it colored, which she probably does, but it's a nice, appropriate shade. 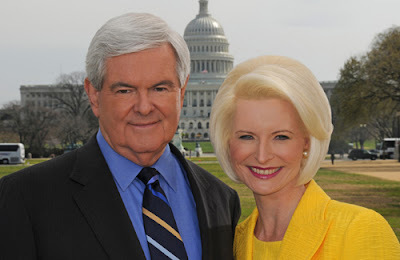 Platinum blonde on women over a certain age just doesn't look right.). And her face looks normal and attractive and un-played-around-with. One last thing. 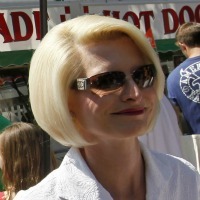 When I was doing "research" on Callista I came across some interesting articles about and pictures of the candidate's wives. 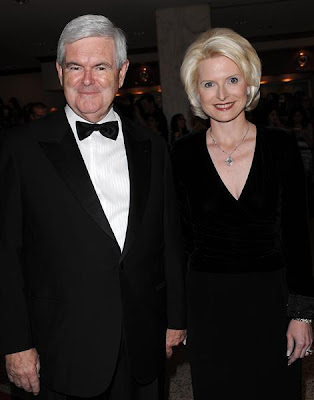 This is Jon Huntsman's wife Mary Kaye and I love, love, love her dress and her whole outfit. This woman has some serious style, I'll say that for her (and him). So there you have it. Me with my Ivy League degree in Political Science hard at work, evaluating candidates on the basis of their wives' appearances. But seriously, I do think the wives matter. And Callista Gingrich does scare me a little, and that picture of her is going to pop up in a nightmare at some point with her chasing after me with a steak knife. Maybe that's what I get! P.S. Today are the New Hampshire primaries and I'm excited about it! 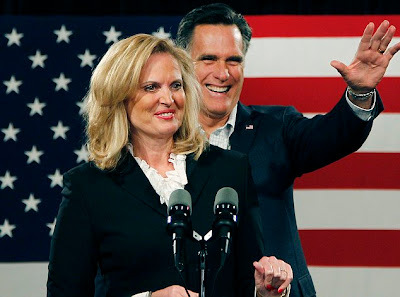 Go Mitt! !